Well, that didn't take long: cars are already parking in the newly painted Hunter Street bike lanes. Who could possibly have predicted that drivers would use the bike lanes as a parking spot if the lanes were not physically separated from the driving lanes? In addition, I guess we now know why the City has put off connecting the Hunter Street bike lanes past the GO station. They have repainted the rest of the road so that it still has two full automobile lanes. Once again, our dedication to excessive overbuilt lane capacity leaves us with crappy cycling infrastructure. Hunter Street carries just 7,500 cars a day at its busiest spot west of John, and it is not a thoroughfare in that section. It's actually begging to be a shared space with level roadway, considering it is largely a drop-off and pick-up zone for the GO station. There is no reason to leave Hunter as a high-speed route - especially past the GO station, which should be attracting even more pedestrian and cycling traffic than the rest of the street! Remember that one urban car lane can handle 10,000 cars a day. There is simply no reason for Hunter to continue as a two-lane street, especially since the excess lane capacity means cars will be able to drive faster than they would on a single lane. Combined with the fact that there is no physical barrier and not even a space buffer between the automobile lanes and the bike lanes, our obsession with lane capacity has totally undermined what could have been an excellent cycle track. On the plus size, the City at least used narrow lanes west of MacNab, although the bike lanes literally spring out of a flower bed at MacNab. There are still two lanes, but they are now two narrow lanes instead of two incredibly wide lanes. This has drivers slowing down a lot more at the bend in the road where it passes Central School and the posted limit is 40 km/h. Normally cars whip down that stretch at 60 km/h and faster. If they had similarly made the driving lanes narrower east of Catharine, they would at least have had room to leave a space buffer between the centre lane and the bike lanes. A more progressive city that was truly committed to complete streets would have repainted Hunter to have 24-hour curbside parking, one driving lane and a protected cycle track. There is simply no good reason not to do this. We really need to get over the debilitating mindset that every street should function as a high-volume, high-speed thoroughfare. These lanes are a joke. Especially eastbound. Far better off taking the right lane of Main Street. They totally failed to create a viable bike route. The efforts and expense of contra-flow traffic lights are wasted on such an illogical and dangerous setup. Bikes forced to swerve into oncoming lanes ... this isn't just bad design, this is evil. And the drivers parking on them are douches and the police should receive complaints and license plate numbers. Far better off taking the right lane of Main Street. I'd say left lane. Left lane bi-directional means oncoming cyclists are on the left, where you expect to find oncoming traffic. Same as what's planned for Cannon. But yes, my preferred design would be a 2-way conversion of Hunter (bike lanes added where possible) and a bi-directional protected lane on the left side of Main. For an implementation of a bike lane on Main, I agree. In this comment I just meant Hunter is useless for eastbound, so the right lane of Main St continues to be my eastbound route across the city. That spot where the lanes start again west of MacNab is literally insane. If you are travelling east, you have to a) bike into oncoming traffic or b) carry your bike over the bushes. What if you are using a cargo bike? What if you have your kid strapped in on the back rack? What if you are carrying groceries? And once you get off the road, what do you do? It makes absolutely no sense. Its actually kind of sickening that City of Hamilton staff could be responsible for designing it this way. Its not just a sign of not being progressive, its incompetence. Apparently you are supposed to take a left up MacNab to Jackson and take Jackson around to Catherine then get back on the eastbound lane there. It would have been nice if they had kept the lane going to James St to at least allow you to hang a right on James St if you were headed that way. Haha I'd be SO embarrassed to be responsible for the contraflow bike lane ending in the picture above. I wonder if those plants have thorns too. Don't forget a third option ... c) jump over the side onto the railway tracks. (Hey internet, that was a joke, don't try it at home). Tokenism. Short and simple. This is just another example of token gestures under the guise of thoughtful Urban Design. Calling this a "bike lane" is an insult to anyone on two wheels. Very disappointing, yet sadly, not surprising. Can someone explain to me why the dickens Hunter is 1-way in the first place? Again, I don't bike in the area, but in general I'd rather see neighborhoods like that sport 2-way traffic rather than this hilariously awful bike-lane. In spots where it's wide enough it could have the typical shoulder-bike-lane like we have on Dundurn. At least then the abrupt end to a bike lane wouldn't push you into oncoming traffic. Since you're not familiar with the area, the "abrupt end" is at the intersection with MacNab so an individual travelling EB would be expected to turn onto it, continue onto Jackson. The large space before the lanes become differentiated looks like it provides space for individuals to cross perpendicularly relative to WB traffic. And that abrupt end could be either where, um, it runs into a flower bed or where it runs into a parked car. What a spectacular failure of basic design. What can I do if I'm riding in the bike lane and come upon a car blocking it? Can I call the cops to report them? What's the best way to deal with this? I have zero patience and tolerance for people who purposely block the bike lane. Car drivers poison and injure 1,700 people every year so seriously they have to be hospitalized. Children and the elderly are particularly vulnerable to being poisoned by car drivers. Children experience more than 1,200 acute bronchitis episodes per year as a result of being poisoned by car drivers. Children experience 68,000 asthma symptom days due to being poisoned by car drivers. The health-care costs of people being poisoned by car drivers is $2.2 billion per year. If someone is going to be such a violent, dangerous sociopath that he chooses to poison innocent children, then it is no surprise that this person should reflect these vicious tendencies in print. So in your view, anyone who operates any motorized vehicle should be charged with a felony? I think a better observation is that we as a society condone the use of a technology that is so blatantly anti-social, harmful and destructive. Yes, it is like asbestos. Once upon a time, we did not realize the lethal danger. Now we do. In the linked report, the Medical Officer of Health proposes solutions to progressively eliminate motor vehicle use and the poisoning of the people. Sure seems like it. KevinLove, do you ever use a vehicle running on fossil fuels? Do you buy products shipped by them? Should you be charged with abetting, since you know your goods come from those, or that you are using them and knowingly killing people? Oh wow do I ever hope that is satire. Unfortunately it is the Sun, so I'm sure it's serious. Now if that isn't sociopath level self absorption, completely oblivious to the existence of anybody except yourself, I don't know what is. Wonder if this was actually written by Mike Strobel, or if he is publishing a submitted opinion? Someone would need a complete lack of shame to be willing to be identified as the author of something that self absorbed. A Toronto driver already wastes 83 hours a year on delays, according to a survey released Tuesday by GPS-maker TomTom. Unsynchronized lights, ill-planned closures, marathons, and other lunacies are bad enough. There are real problems in Toronto not apparent in Hamilton. At the end of the day, if the majority of people are victimized by losing time, the only limited resource in the universe, they will revolt (i.e. ignore bike lanes.) We cannot ignore their suffering. The majority victimized? The majority of people in cars are not victims of congestion. They are the congestion. The idea that everyone in huge metropolis can fit in mostly single occupant cars and have an easy cruise, is delusional. That is what all the congestion is. There are people who want to be on two wheels. It's a good idea to let them. Footprints are much lower. Anyway, more directly to the point of this Sun article we digressed on, but still related to parking on Hunter St bike lanes: After calling cyclists many names including Neanderthal, this person claimed they were not anti-bike. Just anti-congestion. Except there he was stopping in a live lane for coffee, whether bike or vehicle lane, he put his car there "because he felt like it" and blocked a live lane of fellow commuters. 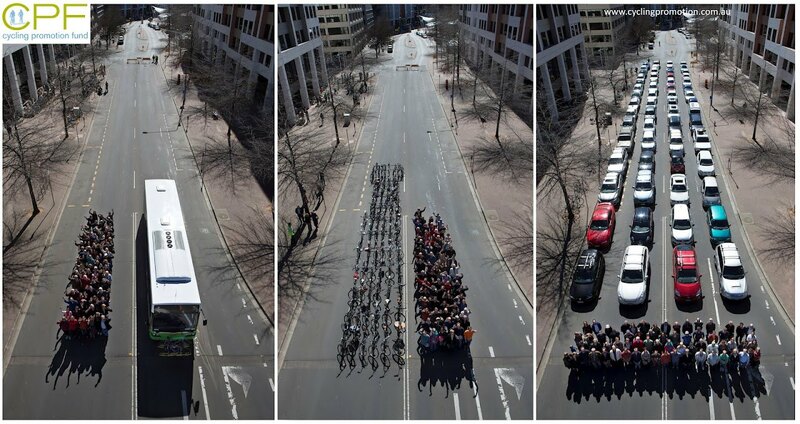 In fact, created congestion for bikes, and for the cars those bikes are pulling out in front of, to go around. So he's not anti-congestion generally speaking. He is anti-congestion for himself. Add the rest of the rant that if your commuting by bike you literally don't matter - very sociopathic and needs to be called out, even for public safety reasons. So it's the same on Hunter Street. If somebody is stopping "for a moment", why not stop in the curbside car lane with your hazard (otherwise known as "park anywhere you want lights"), rather than block the entire bidirectional cycle lane? Because cyclists don't exist? Don't matter? Very self centered mindset, so ahem, a reminder that other people exist too, apparently needs to be said, when it should go without saying. The only effective way to reduce congestion and save people time in a city is to provide a transportation system that makes better use of scarce public right-of-way than allocating most of it to automobile lanes. I will note that one-third of Hamilton residents live 5 km or less from their workplace. Likewise, half of all driving trips in Ontario are 5 km or less. This distance is an easy, comfortable ride on a bicycle - if the infrastructure exists to make such a ride feasible for more than the <1% of people who are willing to ride in mixed traffic, "vehicular cyclist" style. Beyond that, we have been designing our neighbourhoods - especially newer ones - so that destinations are separated far from each other, making it vastly harder to choose walking or cycling for even a trip to the store to pick up a staple. Between the artery-and-dendrite street design, the curvilinear spaghetti of residential streets and the severe enforcement of use-separation, many parts of the city have been rendered effectively unwalkable. And of course there is the fact that our per capita spending on public transit has plummeted since the early 1990s, with service declining and ridership falling in exact lockstep. The only "lunacy" in our transportation system is the decades-long broad-spectrum commitment to forcing nearly everyone to drive for nearly every trip. That is the real cause of the traffic congestion that enrages drivers, and the only solution is to transform our transportation and land use to give people real choices. "Unfortunately it is the Sun, so I'm sure it's serious." I've never taken The Sun seriously! Yikes, car culture entitlement on full display. Drivers parking illegally (and dangerously) in a bike lane are "poor" and "misunderstood" but cyclists who point out such lawbreaking are "accosters", "fanatics", "militants", "bicycloonies", "zealots", "Nazis" and a "creeping menace" who belong to a "bicycult". That piece was cringeworthy even by Toronto Sun standards. On the plus side, that's the first time I've ever read the comments on a Sun article and not been horrified. The same thing you'd do if you were driving and had the same thing happen. Regardless of how well or poorly the bike lane was designed I'm going to use is as often as I can. It's important that the lane is seen as being well used to encourage better design in the future. As for cars parking in the bike lane I'm going to take photos of the license plates and send an email through to the police. If enough people to do this the police may be encouraged to allocate some resources to enforcement. If the lane isn't used it gives ammunition to anyone wanting to dispute future cycling infrastructure. We've been given an opportunity to prove a point so hopefully it won't be wasted. I saw the bike lanes on Hunter last night, they go nowhere I do not see the point, I was actually excited about them until I saw they do not cover the blocks that include the Go train station and the YWCA, both of which I use. Oh well, still have to navigate the cabbie's driving backwards down hunter, unlikely to ride my bike there. I have encountered cars blocking the bicycle lane numerous times. I called the City Traffic Dept to find out what sort of fine would be levied. The answer? A mere $ 26 dollars. Rather shocking considering that by their selfish actions, these illegal parkers force cyclists out into traffic - endangering life & limb. And by contrast, the fine for parking in a 'No Stopping' zone is $ 60 - $ 100 (an infraction that does not necessarily endanger cyclists). If the City was at all concerned about this danger, they would sharply increase the fine and enforcement of this pig-headed behaviour. The fine for parking in a handicapped spot is $300 I was told. If they don't raise the fine for parking in a bike lane, there may be far more handicapped people (cyclists) in the future. As well, the City has now been put on notice that injuries or deaths due to non-enforcement or lax enforcement of bike lane blockers, coupled with paltry fines, actually contributes to dangerous cycling conditions (lulled by a false sense os security provided by a painted white line - and no other safety measures). The lawsuits resulting from this alone could fund proper cycling infrastructure for years to come. City of Hamilton - you have been warned. Take your responsibility seriously and do the right thing. Close call on Hunter! I rode the lanes just to say I did and a car almost hit me. I was riding eastbound in the bike lane and it seemed the driver didn't look for traffic coming from the west on the one-way westbound street. I can easily see how that could occur. It will be the last time I use Hunter to ride eastbound as I feel even Main Street to be safer.